As we stood outside of the Supreme Court, waiting to cross the road, Parliament Square looked like a large traffic island in the heart of ceremonial London. There was plenty of traffic streaming by, including many sightseeing buses and the comical-looking London Duck. Yet, a traffic island was not what the original designer had planned for Parliament Square. When Sir Charles Barry won a competition to design the new Palace of Westminster (Houses of Parliament) after the 1834 fire, Parliament Square was included as part of his designs. There were buildings on the site at that time and Barry’s plan called for the demolition of the buildings and replacing them with the open space to give the new Westminster Palace a better setting. Although Barry’s design was laid out in 1868, it did not last. 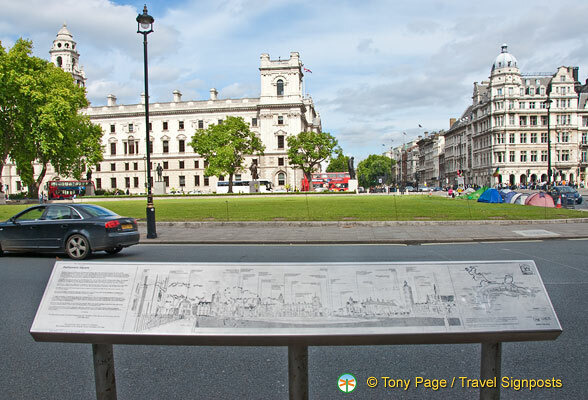 After the Second World War, Parliament Square was redesigned into the current square lawn with paved walkways and formal paths. The busy traffic around the Square has turned it into a traffic island, more or less cutting its link to the rich cultural and historical heritage that it was intended to be a part of. The Mayor of London is keen to improve the Square, but economically, it’s proving a challenge. Symbolically, each side of Parliament Square represents a different arm of the state: Legislature (Houses of Parliament to the east), the Executive (Whitehall to the north) the Judiciary (the Supreme Court to the west) and the Church (Westminster Abbey to the south). With its location, Parliament Square has always played an important part in English heritage as a place of ceremonies and significant historic events. Processions such as the Coronation, royal funerals and weddings all pass through the Square. Up to this day, Parliament Square Garden continues its role as a key part of the ceremonial route between Westminster Abbey and Westminster Hall. In Parliament Square itself stand statues to famous statesmen such as Churchill, Smuts, Palmerston, Disraeli, Peel, Abraham Lincoln and Nelson Mandella. For a long time, Parliament Square Garden has also been the scene of protests and campaigns. The east side of the square, where you see tents in the top picture, is a common area where protestors camp and voice their views about what the government should or should not do. One long-term campaigner has camped there on and off for ten years. But Parliament Square is not just about state and government. In the northwest corner is Roux at Parliament Square, a French fine dining restaurant by Michel Roux Jnr. Let's talk more about this... can you do me a quick 30-second favor and leave a comment below?